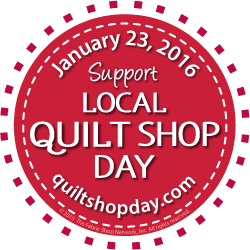 Tomorrow is Support Your Local Quilt Shop Day. 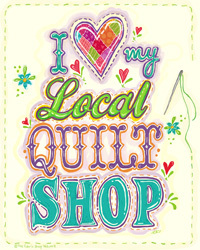 Sadly, I don't have a "local" quilt shop. There are no quilt shops in DeKalb, IL! Now that's just wrong! However, there are several within 30-45 minutes. The closest one is only about 15 minutes but it's very small. The one I probably go to the most is about 30 minutes. They have a lot of sew-ins, classes, etc. and are a Bernina dealer. It is called Stitching on State in Hampshire IL. You can find them here. Soooo....Go support your local shop whoever it is, and where ever it is. There's lots to be said for a local shop versus an online shop. I'm all about "service after the sale" and this shop gives me that! Since I'm still not home, I'll have to find a local quilt shop near the Riverwalk in San Antonio. Do you think I can talk the King into taking me? Maybe I'll just hail a cab and go by myself??? I hear there's one pretty close called Mesquite Bean Quilt Shop. I've been there before but I'm sure they have something calling my name that I "need" before I go home.